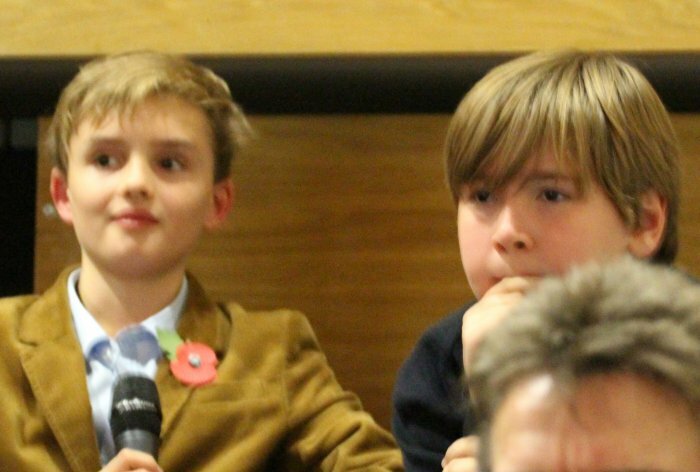 Newton Prep were delighted to welcome the Lord Chancellor, the Rt Hon Michael Gove MP, to its annual Newton Forum in November. 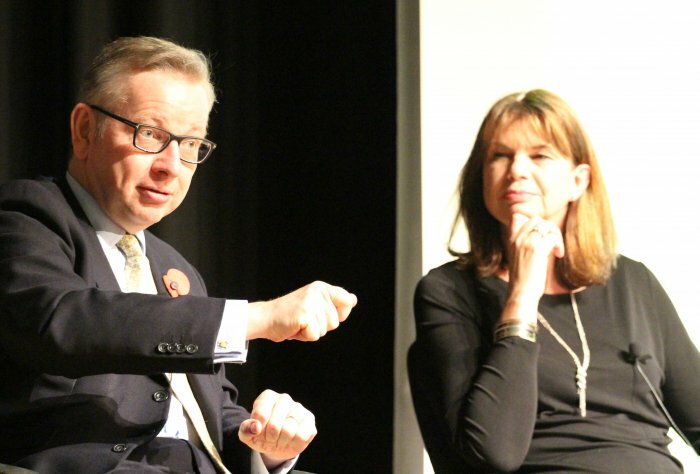 Hosted by headmistress Alison Fleming, ‘An Evening in Con-versation with Michael Gove’ was a wide-ranging and revealing evening, where the former Secre-tary of State for Education shared insights on a range of issues, from his childhood to his stint as the ‘reformer’ of education. Questioned searchingly by both parents, staff and pupils, Mr Gove talked about the importance of innovation and exploration, putting England at the top of the leagues for science and educa-tion, and concluded that, ultimately, character stands young people in better stead than anything else: both in working towards qualifications and in the wider world beyond education. “Above all else, try your hardest, be true to yourself and kind to others,” he told Newton pupils. The Dalai Lama comes to Newton Prep! 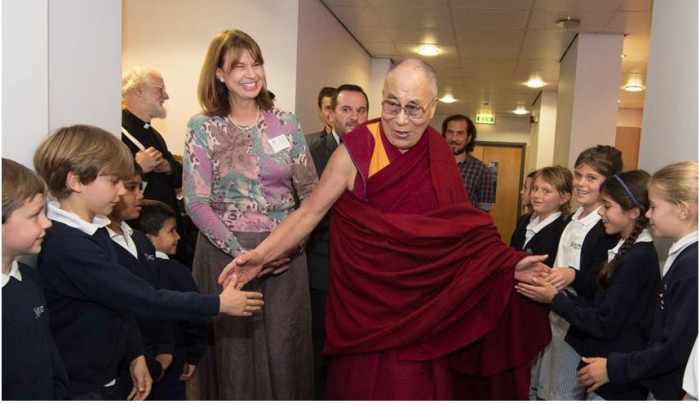 It's not every day that the Dalai Lama drops into school - and this was no ordinary day! His Holiness and former Archbishop of Canterbury Lord WIlliams arrived hand-in-hand for a wonderful day of laughter, wisdom and Inspiring Dialogue with children not just from Newton Prep but from schools and groups of young people from all across London. 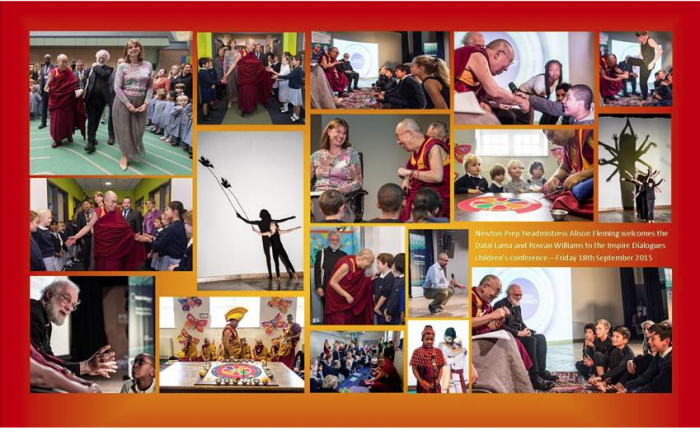 "It's been a unique day for our children, and those from a range of other youth organisations, to be able to voice both ideas and concerns with two people as simultaneously wise and approachable as the Dalai Lama and Lord Williams," said Newton's Headmistress Alison Fleming, who was the master of ceremonies for the conference. 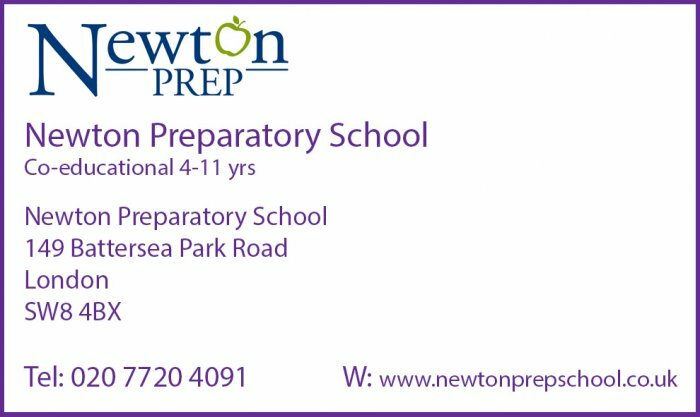 "I was so proud of our Newton Prep children, all 645 of whom lined up along His Holiness's arrival route through the school to sing a welcome song for him, Lord Williams and his entire entourage. A lot of wonderful people worked very hard to put this all together and I know that, for all the children who came, it's been a day that none of us will ever forget." Over a hundred young visitors either performed or participated in the conference from the following groups or schools: Chickenshed, London Bubble, Christ the King Catholic Church, The Holy Spirit Church, The Hackney Pirates, Kid's Venture, Newton Prep, St Mary's Roman Catholic Primary and the school's local partner, St George's Church of England Primary. "Our children were so excited to come and take part," commented Sarah Collymore, St George's Headteacher. "They only found out today who the mystery VIPs were going to be, and now they will never forget singing for the Dalai Lama!" “The opportunity to meet the Dalai Lama was one I will never forget,” said a child from The Holy Spirit Church. “It’s been an amazing day. I even got to make my own lung ta (Tibetan prayer flag) with the monks of the Tashi Lhunpo Monastery while we were watching them make their sand mandala. The Destruction Ceremony for that was incredible to see." The monks from the Tashi Lhunpo Monastery in South India, were invited to the school to enrich the day even further for both the young participants in the conference and for every child at Newton Prep. "They have been here all day," said art teacher Jane Aspeling, "creating from scratch this incredibly intricate sand mandala. Watching the precision and artistry with which they tap out the coloured sand into the tightly detailed swirls of the design, has been so fascinating for all our children, from our three year old babies to our 13 year old young people." 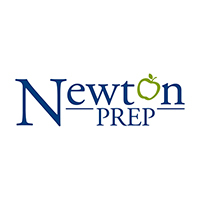 "The monks themselves have loved to see how interested and engaged our Newton Prep children are," added Newton Prep External Affairs Director, Susannah Frieze, who was looking after the monks. " Some of them speak very good English and have been blown away by the range of questions they've been asked today. The Year 5 children were lucky enough to have lunch with the monks so all in all it's been a day of firsts for our children."